Yesterday, Look To The Stars brought you Elton John’s plans to sell his clothes at a charity store this weekend. We can also now reveal that some of his celebrity friends tried some of the clothes on this week to publicize the event. 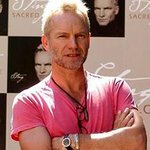 Sting, Neve Campbell and Natalie Imbruglia were all spotted wearing Elton John's old threads in GQ Magazine to help raise money for the Elton John AIDS Foundation. The clothes will be sold at Covent Garden’s Flower Cellars on December 12.